Source: Thanks so much to Steerforth Press/Pushkin Press for providing me with an e-ARC of this book via Netgalley! If you know me, then you know that I adore (or actually, j’adore) everything that has to do with the French culture. The language, the foods, the country (that I unfortunately haven’t traveled to yet), and even more. 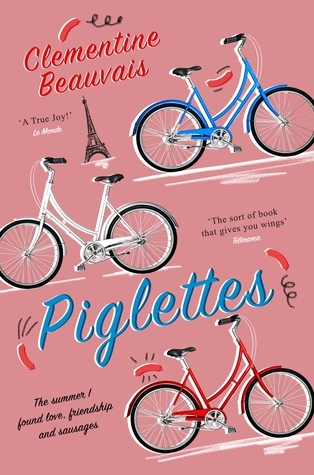 I love reading books set in France just as much, so imagine how excited I was when I found Piglettes on Netgalley! I enjoyed this story for sure, but I think it would be better suited to a younger crowd. This is definitely one of those books that can pass as young adult, but at the same time as a middle grade book, if you get what I’m saying. For a quick synopsis, Piglettes follows three girls named Mireille, Astrid, and Hakima. They were voted as the ugliest girls in their school, and what is worse is that it was online. To overcome their reputation, the trio bikes all the way to Paris to have a garden party with the president. The three become the centre of attention in the eyes of the media, but will that be enough to restore their confidence? As you all probably know, the element that makes or breaks a book for me are its characters. They are a huge weighting of the star rating I give, and unfortunately, the characters in this book were rather bland, taking off a huge chunk of the rating. All of them were quite forgettable, but I still really appreciated the strong, unbreakable friendship between them. This may not be a book with the most wonderful characters, but it is one with the most amazing friendship ties that often aren’t seen too much in literature. To add on, the plot wasn’t particularly great, either. The whole premise just seemed a tiny bit unrealistic to me- I was unable to grasp why the trio suddenly wanted to get up and go on a big adventure. That is definitely an unlikely sight to be seen in real life, and plus, it was slightly far-fetched. Overall, I didn’t LOVE the characters or the plot of Piglettes, but the morals are what struck me the most. This book shows that it isn’t worth it to let others’ words make you feel upset, and I loved that message. As a high schooler, I wasn’t able to enjoy this story to its best potential, but I believe that middle graders absolutely will. Plus, it’s translated from the beautiful language of French! Such a cute book, but I agree it sounds like it’s aimed for a younger audience. I think it’s great to read books from other cultures too – keep it up!